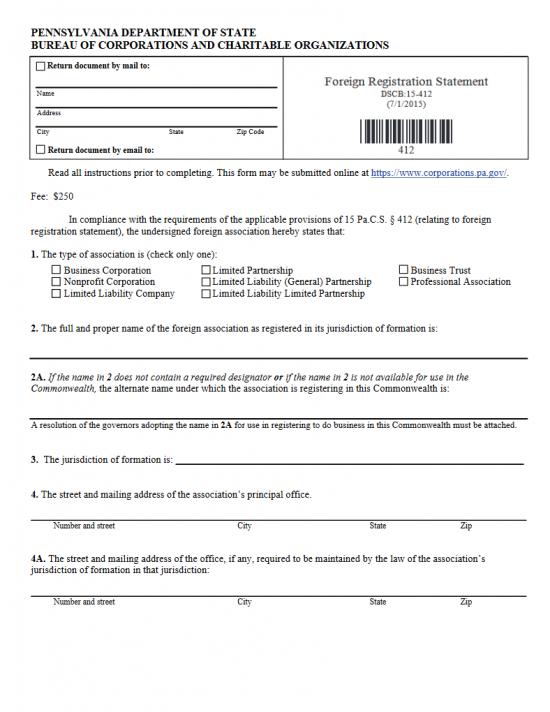 The Pennsylvania Foreign Registration Statement | Form DSCB: 15-412 must be submitted to the satisfaction of the Pennsylvania Bureau of Corporations and Charitable Organizations by foreign corporations so they may operate legally, with corporate status, in the State of Pennsylvania. This document will frame the minimum amount of required information that must be delivered however, depending upon the entity type, more information and additional filings may need to be submitted simultaneously with these articles. 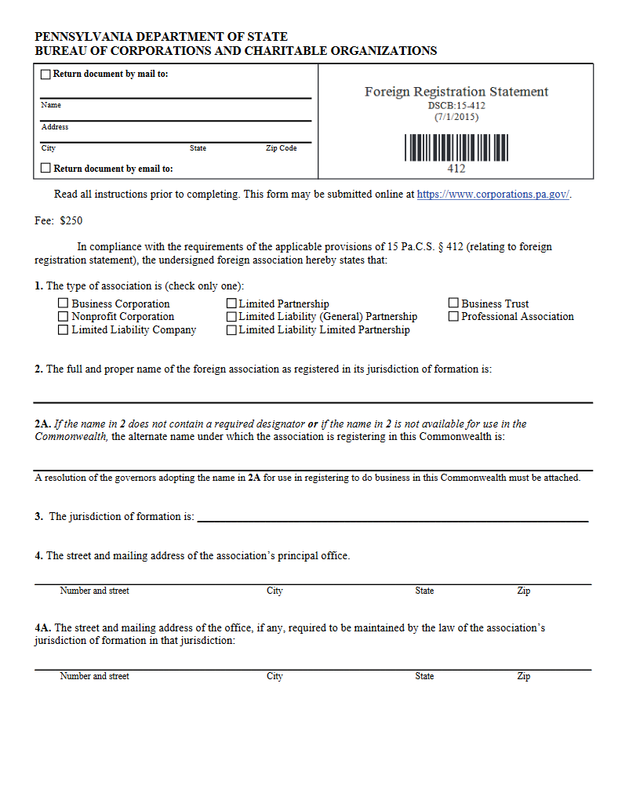 For instance, a professional corporation will need to present the appropriate Pennsylvania licenses while a foreign corporation unable to use its Name will need to submit a “Consent to Appropriation of Name” form and/or a Resolution from the foreign corporation’s Board of Directors to operate under a Fictitious Name. All foreign corporations must submit the Pennsylvania Docketing Statement (Form DSCB: 15-134A). The Filing Fee for the Pennsylvania Foreign Registration Statement | Form DSCB: 15-412 is $250.00. This may be remitted with a check that is payable to the “Department of State.” It should be noted that checks being submitted for this purpose must have the Issuer’s Full Name and Address commercially printed at the top of the check. You may file by mail by sending the submittal package to: Pennsylvania Department of State, Bureau of Corporations and Charitable Organizations, P.O. Box 8722, Harrisburg, PA 17105-8722. Step 1 – Download the Pennsylvania Foreign Registration Statement and the Pennsylvania Docketing Statement from the above links. Step 2 - First you must report the Recipient Information for the party who will receive an answer to this submission. To do this, locate the box in the top left hand corner of the page. You will have two check boxes each followed by a section requiring information. If you wish the Pennsylvania Bureau of Corporations and Charitable Organizations to respond by mail then check the first box. If this is the case, enter the Full Name and Full Address of the Recipient. You may, instead, choose to receive a response by Email. If so, mark the second check box and enter the Recipient’s Email Address. Step 3 – In Item 1, you must choose one of the choices to define the entity applying for a Certificate of Authority. You may only choose one of the following by marking the corresponding check box: Business Corporation, Nonprofit Corporation, Limited Liability Company, Limited Partnership, Limited Liability (General Partnership), Limited Liability Limited Partnership, Business Trust, or Professional Association. Step 4 – Report the Full Name of the foreign corporation applying for the Pennsylvania Certificate of Authority precisely as it appears on the record books in its parent state of jurisdiction in Item 2. Step 5 - In some cases, a foreign corporation will not be allowed to operate in the State of Pennsylvania under its True Name. That is, it will be required to operate under a Fictitious Name. If this is such an instance, the Fictitious Name must be entered on the blank line in Item 2A. Note: Corporations operating under a Fictitious Name must submit a Resolution to Operate Under a Fictitious Name drawn up and signed by its Board of Directors. Note: An Application for Registration of Fictitious Name will need to also be filed and approved – ideally, before submitting this Statement application. Step 6 – In Item 3, enter the jurisdiction (State or Country) where the filing entity is incorporated on the blank line provided. Step 7 - In Item 4, you must report the Street and Mailing Address of the filing entity’s Principal Office on the blank line provided. This must be composed of a Building Number, Street, City, State, and Zip Code. Step 8 - If the filing entity is required to maintain an office in its parent jurisdiction then enter the Street and Mailing Address of the Office in the Jurisdiction of Formation on the blank line provided in Article 4a. If there is no such requirement in the filing entity’s parent state then you may leave this section blank. Step 9 - In Item 5, the Registered Office Provider information must be entered in one of the sections present. If the filing entity has obtained a noncommercial Registered Office Provider then enter the Physical Address of its location in section 5a. Make sure to enter the County after the Zip Code. If the filing entity has obtained a commercial Registered Office Provider then enter the Full Name of the commercial Registered Office Provider then the County where the commercial Registered Office Provider is located on the blank line in section 5b. Step 10 – If the filing entity does not have a series (i.e. powers/liabilities) then mark the first box. If the filing entity does have a series then place a mark in the second box. Step 11 - Article 7 will give the option to separate the Date of Effect from the Date of a successful filing. This means that a filing entity may submit this Statement application, gain approval and a Certificate of Authority, but refrain from obtaining corporate status until the Date reported in Article 7. If you wish the Date of Effect to be the same as the Filing Date, then place a mark in the first box. If you would like to have a specific Date of Effect, then mark the second box and enter the desired Date of Effect on the space provided. Note: A Date of Effect may only be after the Filing Date. Step 12 - Article 8 will apply only to Limited Liability Companies. This does not have to be addressed when registering a corporation. You may leave this article blank. Step 13 - The end of this document will required the Calendar Day, Month, and Year this Statement is being signed in the last paragraph. Step 14 - Locate the line labeled “Name of Association” and enter the Full Name of the filing entity as it appears in Article 1. Below this an authorized representative of the foreign corporation must Sign his or her Name. Finally, the Signature Party must report his or her Title. Step 15 - Next you will need to fill out the Pennsylvania Docketing Statement. 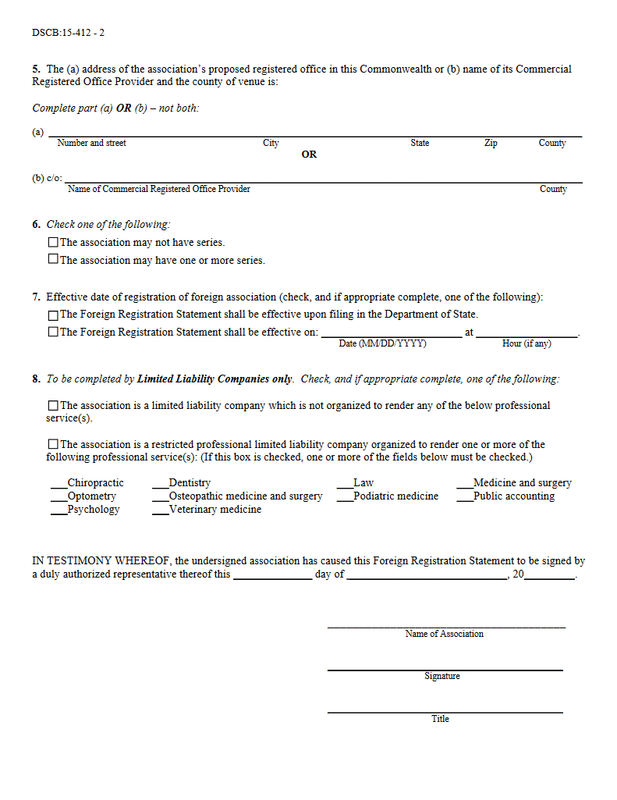 This will require the Full Name of the foreign corporation (if operating under a Fictitious Name, then use the Fictitious Name), the Name and Mailing Address of the individual responsible for the Initial Tax Reports, and a Description of the Business Activity of the foreign corporation in the State of Pennsylvania. Step 16 - In order to file, you will need to prepare a check of $250.00 for the Filing Fee. This should bear the Name and Address of the Issuer, printed commercially, at the top of the check and be payable to Department of State. Step 17 - Take all the required paperwork and filings and organize them with the completed Pennsylvania Foreign Registration Statement | Form DSCB: 15-412. All required paperwork and payment of the Filing Fee must be submitted simultaneously by mail.